"It is our greatest hope that if someone has her, that they would just release her and claim that money we have raised for her freedom"
The mother of a missing Iowa college student pleaded Thursday with anyone who may have abducted her daughter to let her go and instead claim a pot of reward money that has ballooned to $172,000. Laura Calderwood said during a news conference that she believes her daughter, 20-year-old Mollie Tibbetts, is alive but has potentially been kidnapped. She announced the new reward amount, which spiked from $2,000 offered earlier this week after donations poured in from across the nation. Tibbetts' disappearance has baffled investigators since she went missing more than two weeks ago. Calderwood said the money would be paid to anyone who provides information that leads to her daughter's safe return. "If someone has abducted her, we are pleading with you to please release her," Calderwood said. "It is our greatest hope that if someone has her, that they would just release her and claim that money we have raised for her freedom." 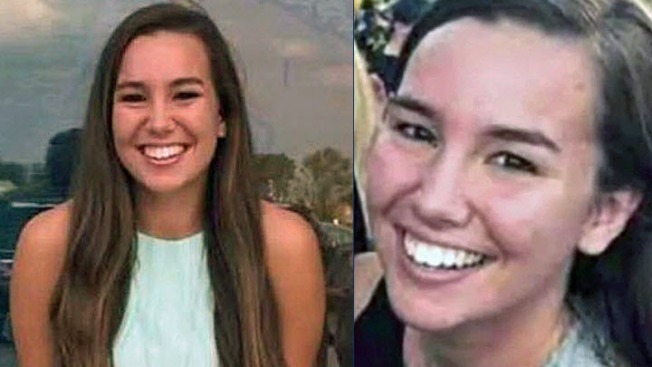 Tibbetts was last seen on the evening of July 18, when she went for a routine jog in her hometown of Brooklyn, Iowa, a town of about 1,400 people in central Iowa. She was dog-sitting that evening for her boyfriend and her boyfriend's brother, who were out of town, at a home where she was living this summer after completing her second year at the University of Iowa. Tibbetts was reported missing the next morning when she didn't show up for work at a daycare in a nearby town. The FBI and dozens of investigators from state and local agencies are working on the case but have so far hit dead ends. The latest came Thursday, when police confirmed that a possible sighting of Tibbetts at a Missouri truck stop turned out not to be her. Crime Stoppers of Central Iowa spokesman Greg Willey promised to protect the anonymity of tipsters who call in or submit tips online, saying the group uses software that scrubs identifying information. He said the group exists for people who cannot come forward to police, including those who are guilty or involved in a crime. Mollie's father, Rob Tibbetts, praised the investigation, saying it has been large, sophisticated, aggressive and sensitive to the family. But he said he believes the case will be solved by someone who comes forward with new information. "If you have nothing to hide, you have nothing to fear. Come forward, bring information to the authorities, and let's bring Mollie home," he said.